I’ve ridden four species of animals so far: a few horses, a camel, a donkey, and an elephant – this roster does not include any time I’ve ever tried to ride my dog. I think it’s fair to say that I’m terrified of riding animals by this point. For some reason I always think I’m going to fall off, and the last time I rode a horse, I actually did almost get bucked off and left with a fear of horses. I don’t know if many of you have ridden camels. I feel like it’s a kind of “foreign experience,” or at least a “traveler’s experience.” My family and I rode camels on the edge of a desert near Yazd when we went to Iran a few years ago. From what I know, camels are some of the most uncomfortable creatures to ride. Let’s just say those humps are hell on your groin and inner thighs, and that pain lasts for another day too. The scariest part of riding a camel is the boarding process. The camel will be sitting on the ground so you can get on it, and then it jolts up and starts walking. Once you get a feel for the camel’s walking pattern, riding isn’t so bad anymore. You kind of end up moving with the camel, but that’s probably true with any animal. There were a bunch of flies on the camels’ faces and it grossed me out. They probably had a symbiotic relationship going on, but I still had trouble looking at it for long. I might have not completely enjoyed riding a camel, but being on the edge of a desert was really cool. There weren’t any other people around and watching the wind reshape the dunes was incredible. It wasn’t even a big deal when the wind blew my veil off since there weren’t many people around (don’t worry, I didn’t lose it.) There were these really cool black rocks in the sand. My sister took one back to the states – it’s somewhere around the house I think. Excluding the minor pain and fear, the camel ride was a good experience. Here’s me holding onto my dad for dear life. 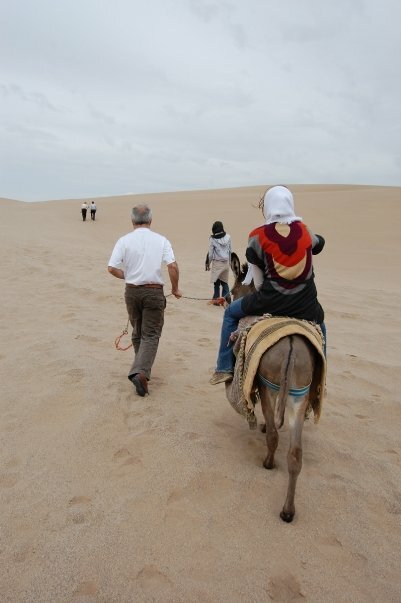 My dad’s cousin Alireza didn’t want to ride a camel (he must be afraid of riding animals too! ), so he walked alongside us. 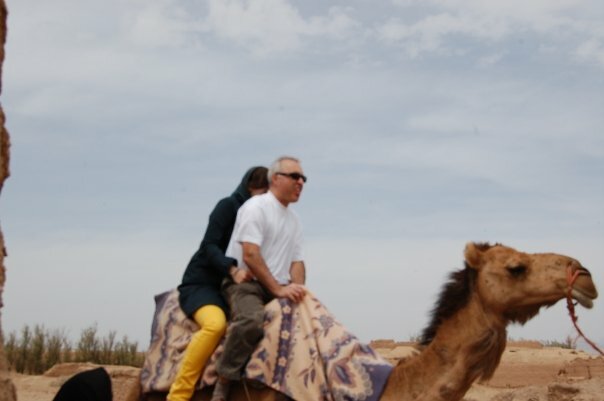 His wife Sadaf is on the middle camel, and I’m not sure who’s riding the lead camel. 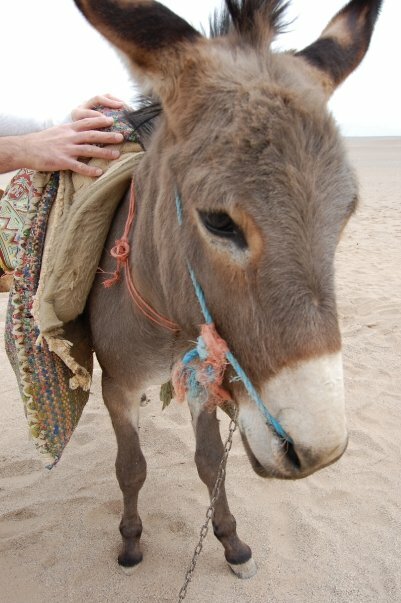 This is Maloos, the donkey with an attitude. Whenever somebody got on her, she would sit down because she didn’t want to carry any extra weight – but hey, can you blame her? 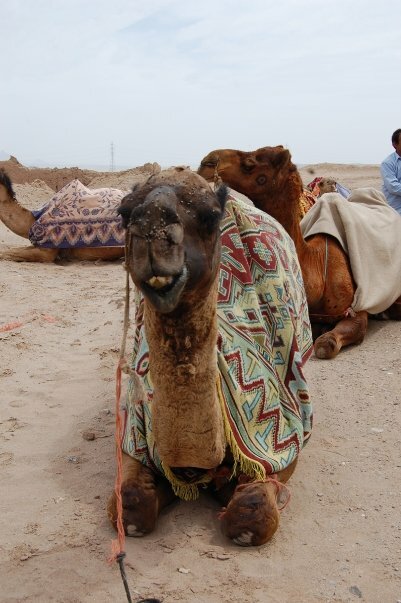 When we were heading back to the bus (we stopped a little way into the desert and walked around for a while), I tried to ride her, but she did not want that to happen so I ended up walking – I didn’t want to face the camel again. I have no idea how these people managed to get that rope through her nostrils. And apparently Maloos let my sister ride her for a while… I don’t remember this, but I see Alireza in the front of the picture so I must have taken it. Well I’m falling asleep, so I’ll just save my elephant ride story for another post. Goodnight everybody!